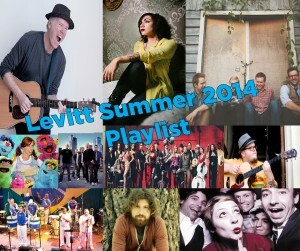 Levitt 2014 Summer Playlist is Here! Whether your local Levitt’s season is well underway or you’re waiting for the concert season to start up again, check out some highlights from 2014 with this summer playlist of Levitt performers! From Latin fusion to Celtic, Big Band Jazz to rock and blues, Levitt has something for everyone! Summer 2014 playlist artists include: Casey Abrams (pop); John Fullbright (Americana/folk/rock); Young Dubliners (Celtic Rock); Rosanne Cash (country/folk/rock); Alo Brasil (Brazilian); Black Violin (classic); The Damn Quails (folk); Janiva Magness (Blues); Ceci Bastida (Latin); Telegraph Canyon (country); Cas Haley (reggae/rock); The Hot Sardines (jazz); Rick Trevino (country); Jose Feliciano (soft latin/bolero/acoustic); The Cowsills (bubblegum pop); Carolyn Wonderland (blues); Marcia Ball (blues); Tab Benoit (swamp blues); Baskery (alt. country); Incendio (world guitar); Black 47 (Celtic punk); Ruthie Foster (blues/folk); Old Crow Medicine Show (bluegrass); Vaud and the Villians (cabaret/jazz); Very Be Careful (cumbia); Carlton & The Shoes (reggae); Playing For Change (World); Loudon Wainwright III (Americana); Richard Thompson (folk rock); Kiddle Karoo (Children’s). This entry was posted in Levitt Artists and tagged Alo Brasil, Baskery, Black 47, Black Violin, Carleton & The Shoes, Carolyn Wonderland, Cas Haley, Casey Abrams, Ceci Bastida, Cynthia Sayer, Incendio, Jack Johnzon, Janiva Magness, John Fullbright, Jose Feliciano, Kiddle Karoo, Louden Wainright III, Marcia Ball, Old Crow Medicine Show, Ozomotli, Playing For Change, Richard Thompson, Rick Trevino, Rosanne Cash, Ruthie Foster, Tab Benoit, Telegraph Canyon, The Cowsills, The Damn Quails, The Hot Sardines, Vaud and the Villains, Very Be Careful, Young Dubliners on July 29, 2014 by Isabella Ramos.